The question is what is the connection between bar and the Hebrew word for son - בן ben? And does bar as "son" have a connection to any of the other meanings of the word bar, such as "outside", "pure" or "grain"? The change of n to r in Aramaic, Syriac, and Mehri is difficult to explain; it may be due to regressive dissimilation. 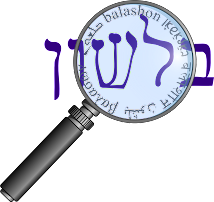 bor בור - lye, alkali, potash, from ברר. Related to another word for lye, borit בורית. Surprisingly, he makes no connection to "borax", which has the same meaning, but is of Persian origin (this book does connect the two). bar בר - exterior, outside. May have developed from another meaning of bar - "open field". Also related is the adverb bar, meaning "except, outside of". beram ברם - but, however. A contraction of the Aramaic בר מא - "except what". baraita ברייתא - the Tanaitic sayings not incorporated in (excluded from) the Mishna. "ward of a Spanish or Spanish-speaking city," sometimes also used of rural settlements, from Sp. barrio "district, suburb," from Arabic barriya "open country" (fem. ), from barr "outside" (of the city). Main modern sense of "Spanish-speaking district in a U.S. city" is 1939; original reference is to Spanish Harlem in New York City. It's worth noting that Stahl, in his Arabic etymological dictionary, disagrees with Klein, and connects bar as "son" with bar as "out". He notes the Hebrew word for "offspring, descendant", צאצא tze'etza, which derives from the root יצא - "to go out". So too does the child "go out" from his parents.